Adirondack Photographer, Eric Dresser has been photographing Nature and Wildlife Photography for the past 50 years! Here, Eric shares some of his stunning photos of Adirondack Owls, along with information about these magnificent creatures. 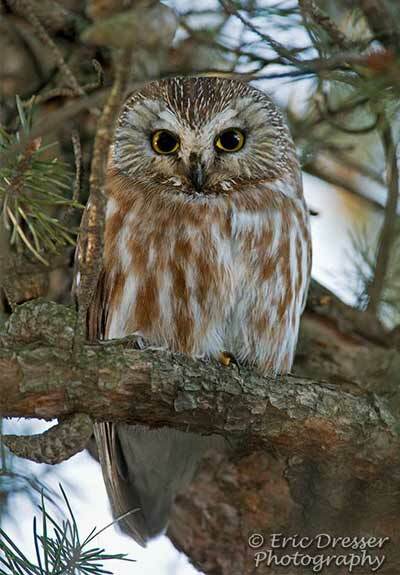 The Saw-whet is the smallest of our Northeastern owls measuring about 7 or 8 inches tall. They nest in tree cavities and feed on rodents, but will also eat small birds and insects. They are quite tolerant and allow a close approach. Eric was lucky enough to have friends allow him to photograph this Screech Owl that was in their backyard. They are cavity nesters and will often use the same hole as protection throughout the remainder of the year. This small owl varies in color - some can be reddish in color; known as Red Morph. This one is a Gray Morph. 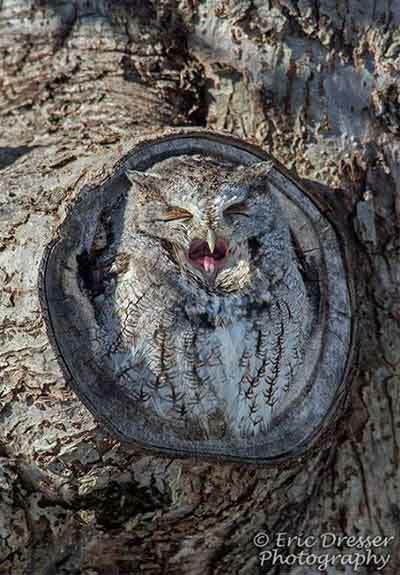 It looks like this Screech Owl had a long night! According to Eric, it would go down in the hole; then reappear in the entrance to warm up when the sun came out! 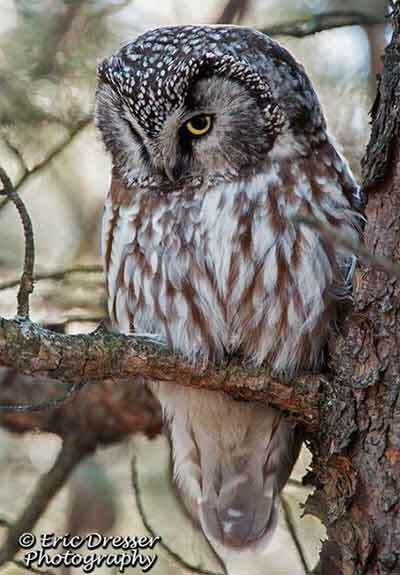 The Boreal is another small owl; the male being noticeably smaller than the female. Eric believes this shot is of a male, as it was about 8 inches in length. The females are about 11 inches tall. Eric found this guy in Ontario, Canada, however, they can occasionally be found in the Adirondacks during the winter months. 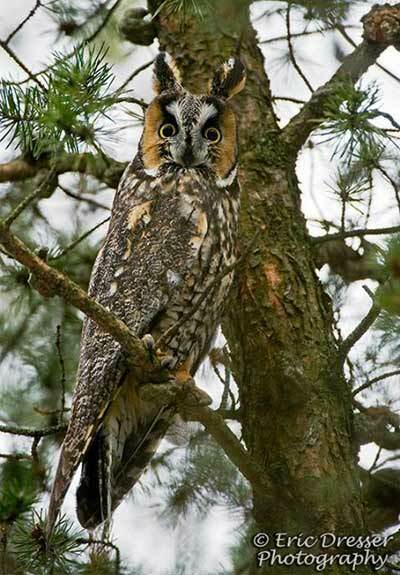 The first Long-Eared Owl that Eric ever saw was as a young boy, in a small woodlot behind the house where he grew up. While he initially thought it was a Great-Horned, he soon realized it was in fact a Long-Eared Owl, as they are noticeably smaller than the Great-Horned. He has the best luck finding them while they're roosted in conifers, usually quite close to open grassy fields. They are often quite close to the tree trunk as well. The Great-Horned Owl, also known as the Tiger Owl or the Hoot Owl, is a large owl native to the Americas. These thick-bodied owls have two prominent feathered tufts on their heads, with broad wings. Blue Jays and Crows also harass owls. 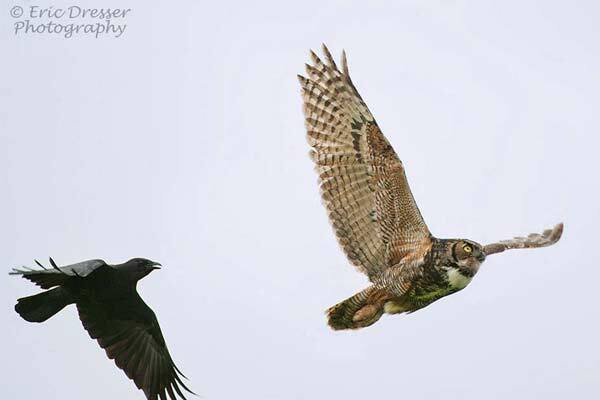 A crow was pestering this Great-Horned Owl until it finally flew away, and Eric was able to snap the shot! Chickadees seem to enjoy harassing little owls. They do so by grouping up and scolding little owls like the Boreal, Screech and Saw-whet. Always listen while walking through the woods. If you hear birds raising a fuss, be sure to go over and check the tree that they're in. Eric notes that walking slowly with a zigzag approach works well. Stop often where you are visible to the owl and remain there for several minutes before moving. This seems to make the owl much more tolerant of your presence. Watch for Owl Pellets on the ground. These pellets are regurgitated non-digestible parts of small mammals that the owl has eaten. When Can I Spot An Owl? Wondering what the best times are to spot an owl in the Adirondacks? Our Facebook fans gave us their input!